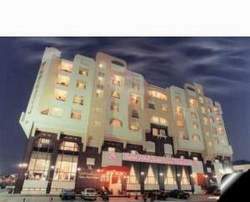 Safeer Hotel Suites Muscat is Ideally placed at Al Khuwair-madinat Sultan Qaboos, Safeer Hotel Suites Muscat is just a 20 minutes drive from the Seeb International Airport (Muscat) and besides being at a short deistance from Goverment offices and Embassies, its within an easy drive to the central business district making Safeer Hotel Suites Muscat is ideal for business stay. If you are here for pleasure, Safeer Hotel Suites is surrounded by exclusive shopping malls, historic, cultural and entertainment centers and beaches. Country’s leading and Reputed luxury hotel suites at the heart of Muscat City very near to the commercial and residential area with a profile of 81 well appointed suites, multi cuisine restaurant, coffee shop, and conference hall, phone & fax, internet connection and other International Standard facilities. Al Shams Coffee shop with its traditional shape is a recent addition to safer suites services; the coffee shop provides its unique services to safer guests and the public. The decoration of coffee shop resembles the traditional Oman’s sabla with its well-known privacy, spacious and hospitality style. The known coffee shop service menu includes selections of light snacks, beverages and fresh juices.